NATO-backed terrorists along Turkish-Syrian border establish Al Qaeda-style "Virtue & Vice Police," heralding the West's true designs for Syria. November 24, 2012 (LD) - An obscure, unreported pair of Getty images created on November 21, 2012 depict masked, armed terrorists atop a building with the words "Committee for Promotion of Virtues and Prevention of Vice" scrawled across its facade. The images were taken in al-Bab, northern Syria. 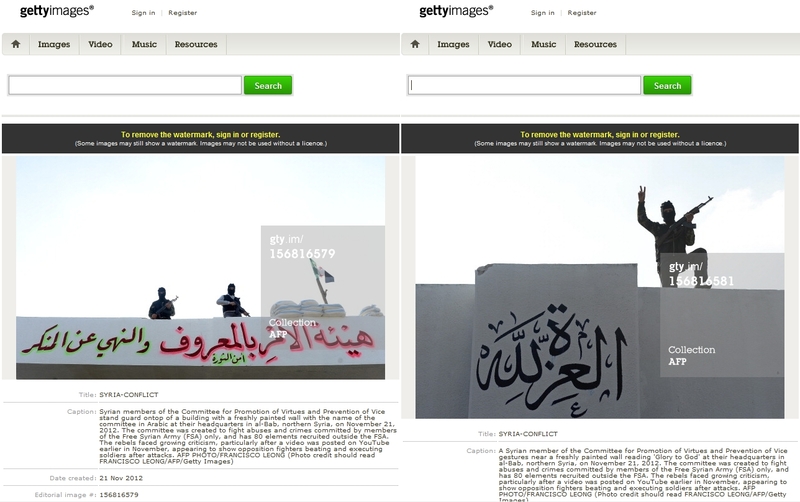 Images: Screenshots from Getty Images depicting Al Qaeda-style "virtue police" atop a building in northern Syria. The accompanying captions provided by AFP run roughshod over the intelligence of potential readers, claiming the "Committee for Promotion of Virtues and Prevention of Vice" is actually aimed only at "FSA" fighters, and seeks to "fight abuses and crimes committed by members of the Free Syrian Army." In reality, the West and its media agencies are continuing to bury a premeditated US-Israeli-Saudi plan to fund and arm sectarian extremists to overrun Syria. Syrian members of the Committee for Promotion of Virtues and Prevention of Vice stand guard ontop of a building with a freshly painted wall with the name of the committee in Arabic at their headquarters in al-Bab, northern Syria, on November 21, 2012. The committee was created to fight abuses and crimes committed by members of the Free Syrian Army (FSA) only, and has 80 elements recruited outside the FSA. The rebels faced growing criticism, particularly after a video was posted on YouTube earlier in November, appearing to show opposition fighters beating and executing soldiers after attacks. The caption presumes absolute ignorance on behalf of potential readers as to what "Committee for Promotion of Virtues and Prevention of Vice" actually means in the context of sectarian extremism linked to groups such as Al Qaeda, leading US-backed efforts to topple the Syrian government. Not only do the committees have nothing to do with fighting "abuses and crimes committed by members of the Free Syrian Army," but to suggest that the "committee" is only policing fellow terrorists betrays the last 2 years of documented evidence regarding the so-called "FSA" and its members who hail from Al Qaeda linked groups both inside Syria and beyond, including the notorious Libyan Islamic Fighting Group (LIFG) hailing from Benghazi, Darnah, and Tobruk, Libya. "Virtue Police" Simply a Manifestation of NATO-backed Terrorist Flooding over Turkish Border. 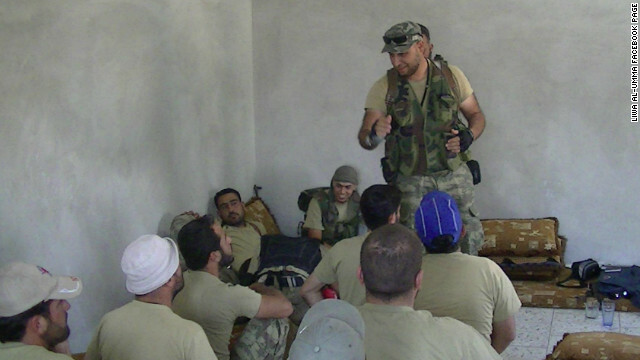 It was exposed at length that many of the so-called "Free Syrian Army's" fighters were in fact foreign terrorists imported into Syria via long-established Al Qaeda networks used to feed fighters first into Afghanistan during the 1980's, then into Afghanistan and Iraq during America's occupation of both nations over the past decade. 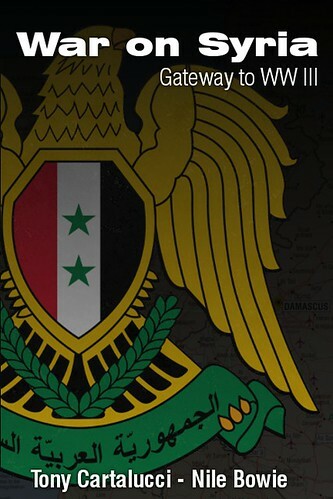 The documented details of this network were exposed in the extensive academic efforts of the US Army's own West Point Combating Terrorism Center (CTC). Two reports were published between 2007 and 2008 revealing a global network of Al Qaeda affiliated terror organizations, and how they mobilized to send a large influx of foreign fighters into Iraq. 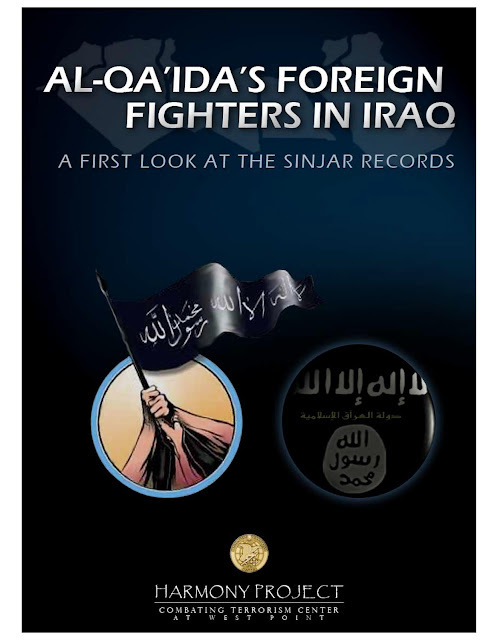 Image: Cover of the US Army's West Point Combating Terrorism Center report, "Al-Qa'ida's Foreign Fighters in Iraq." The report definitively exposed a regional network used by Al Qaeda to send fighters into Iraq to sow sectarian violence during the US occupation. This exact network can now be seen demonstrably at work with NATO support, overrunning Libya and now Syria. The terrorists in the eastern Libyan city of Benghazi that US Ambassador Stevens was arming, is described by the 2007 West Point report as one of the most prolific and notorious Al Qaeda subsidiaries in the world. The first report, "Al-Qa'ida's Foreign Fighters in Iraq," was extensively cited by historian and geopolitical analyst Dr. Webster Tarpley in March of 2011, exposing that NATO-backed "pro-democracy" rebels in Libya were in fact Al Qaeda's Libyan Islamic Fighting Group (LIFG), listed by the US State Department, United Nations, and the UK Home Office (page 5, .pdf) as an international terrorist organization. The West Point report exposed Libya as a global epicenter for Al Qaeda training and recruitment, producing more fighters per capita than even Saudi Arabia, and producing more foreign fighters than any other nation that sent militants to Iraq, except Saudi Arabia itself. Image: Libya, despite its relatively small population, came in second overall, producing foreign fighters to wage sectarian war in Iraq. Libya exceeded all other nations per capita in producing foreign fighters, including Al Qaeda's primary patrons, Saudi Arabia. These diagrams were produced by West Point's Combating Terrorism Center, on pages 8 and 9 of its "Al-Qa'ida's Foreign Fighters in Iraq" report. But Libya's foreign fighters weren't drawn equally from across the nation. They predominately emanated from the east (Cyrenaica), precisely where the so-called 2011 "pro-democracy revolution" also began, and where most of Libyan leader Muammar Qaddafi's attention had been focused over the course of at least three decades, fighting militant extremists. The cities of Darnah, Tobruk, and Benghazi in particular fielded the vast majority of foreign fighters sent to Iraq and also served as the very epicenter for the 2011 violent, NATO-backed uprising. Image: (Left) West Point's Combating Terrorism Center's 2007 report, "Al-Qa'ida's Foreign Fighters in Iraq" indicates that the vast majority of Al Qaeda terrorists arriving in Iraq from Libya, originated from the country's eastern region, and from the cities of Darnah and Benghazi in particular. (Right) A map indicating rebel held territory (red) during Libya's 2011 conflict. The entire region near Benghazi, Darnah, and Tobruk served as the cradle for the so-called revolution. The US government is just now revealing the heavy Al Qaeda presence in the region, but clearly knew about it since at least as early as 2007, and as other reports indicate, decades before even that. Clearly, the US military and the US government were both well aware of the heavy Al Qaeda presence in Cyrenaica since as early as 2007. When violence flared up in 2011, it was clear to many geopolitical analysts that it was the result of Al Qaeda, not "pro-democracy protesters." The US government, its allies, and a complicit Western press, willfully lied to the public, misrepresented its case to the United Nations and intervened in Libya on behalf of international terrorists, overthrowing a sovereign government, and granting an entire nation as a base of operations for the Libyan Islamic Fighting Group (LIFG). Image: (Left) West Point's Combating Terrorism Center's 2007 report, "Al-Qa'ida's Foreign Fighters in Iraq" also indicated which areas in Syria Al Qaeda fighters filtering into Iraq came from. The overwhelming majority of them came from Dayr Al-Zawr in Syria's southeast, Idlib in the north near the Turkish-Syrian border, and Dar'a in the south near the Jordanian-Syrian border. (Right) A map indicating the epicenters of violence in Syria indicate that the exact same hotbeds for Al Qaeda in 2007, now serve as the epicenters of so-called "pro-democracy fighters." In Syria, the southeastern region near Dayr Al-Zawr on the Iraqi-Syrian border, the northwestern region of Idlib near the Turkish-Syrian border, and Dar'a in the south near the Jordanian-Syrian border, produced the majority of fighters found crossing over into Iraq, according to the 2007 West Point study. These regions now serve as the epicenter for a similar Libyan-style uprising, with fighters disingenuously portrayed as "pro-democracy" "freedom fighters." These are also the locations receiving the majority of foreign fighters flowing in from other areas described in the 2007 report, mainly from Saudi Arabia via Jordan, and from Libya, either directly, through Turkey, or through Egypt and/or Jordan. 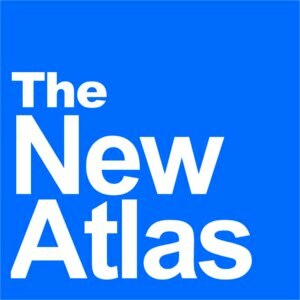 While many Western think-tank documents, including the joint US-Israeli "Clean Break: A New Strategy for Securing the Realm," recognized Syria as a threat to corporate-financier hegemony throughout the Middle East and beyond, it wasn't until at least 2007 that a fully articulated plan was developed for actually rolling back or eliminating Syria as a viable, independent nation-state. The specific use of Al Qaeda-affiliated militant organizations, not just inside Syria, but from across the region was a key component of the plan, revealed by Pulitzer Prize-winning journalist Seymour Hersh in his 2007 New Yorker report titled, ""The Redirection: Is the Administration's new policy benefiting our enemies in the war on terrorism?" But despite this documented conspiracy stretching back years before the so-called "Arab Spring" began in 2011, and now visible manifestations of sectarian extremists establishing Al Qaeda-style institutions to brutalize and subjugate the Syrian population along the Turkish-Syrian border, the deceitful, misleading captions of Getty Images, as well as repetitive op-eds, reports and official statements across the Western media and from government representatives, continue in their attempts to deny the so-called "Free Syrian Army" are in fact international terrorists, driven by sectarian extremism, not aspirations for a "free and democratic" Syria. Along with this reality, is the West's propping up of the "Syrian National Council," mere window dressing for the extremist groups the West and its Persian Gulf allies of Saudi Arabia and Qatar are arming and funding. As undeniable evidence mounts regarding who the West is really supporting, and what the Syrian government is really fighting against, the credibility of the silent, ineffectual UN and the "primacy of international law" crumbles by the day.